﻿﻿Margaret Eleanor Leigh is a writer without roots. Born and raised in apartheid South Africa, she’s lived in Wales, New Zealand, England, Greece and Scotland. Now she’s back in Wales, the land of her fathers. Her working past is just as colourful: she’s been a journalist, a bureaucrat, a university tutor, a bookseller, and a proof-reader. First the man and now she's falling for a dog...And she doesn't even like dogs...Or men, for that matter. 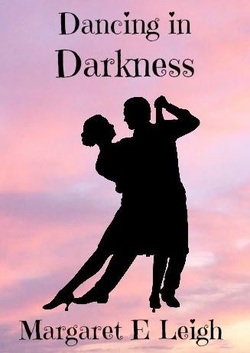 Dancing in Darkness is romantic suspense in which Charlotte's ability to discern truth from falsehood becomes a matter of love, life and death. “You do? What about?” Her knees were starting to buckle. “What about last night?” If she hadn’t been leaning against the wall she’d have sunk to the floor. As it was she nearly dropped the phone. “I want to do it again,” he said. This time she did sink to the floor. Art historian Charlotte James is trying to put the past behind her, as well she might. That criminal conviction isn’t anything to be proud of. So when a dodgy dealer called Evans comes tapping on her door, saying he’s got some ‘bits and pieces’ that no doubt fell off the back of a museum van, her immediate instinct is to walk away. But Charlotte really isn't in a position to be fussy about clients. Her art consultancy business is circling the plughole, and lately she’s been reduced to cataloguing teapots. So she ignores the voice of reason and good sense and steps into Evans’ world. Evans has somehow got his hands on a drawing that appears to be a genuine Van Gogh. There’s only one problem. The original is hanging on the walls of the Museum of Modern Art in Cardiff. Or is it? Thus, begins an investigation that will take Charlotte back to World War II, a time when London’s major art collections were evacuated to the countryside to avoid the Blitz. It was also a time that afforded someone the perfect opportunity for a little light forgery. In uncovering the crimes of the past, Charlotte must also confront the villains of the present, and this includes Evans. Only a rash outsider would dare seek to disrupt Greece's illegal trade in women. Meet Agnes Jones. She's very rash indeed. The last time she saw him he was in the dock of the accused, manacled by guards, a comfortable distance across a crowded courtroom. She had prayed never to see him again. She had moved six thousand miles across the world to make sure her prayers were answered. But now he was out, and he’d followed her. I was middle aged and homeless, soon to be penniless, and really and truly no different from that bag lady sitting on the bench over there. I couldn’t jack it in and go home, because I didn’t have a home to go to anymore. The bicycle and the tent were now home. Wherever I found myself on any given night was now home. And that meant, for tonight, Genoa Piazza Principe Railway Station was home. I was cycling across Europe in search of Utopia, a place I believed was located somewhere in Greece. When I found it, I would start a new life there. It was my big, fat, Greek midlife crisis. But now I was having a crisis within a crisis. What on earth had I been thinking?